The Hughes & Kettner Black Spirit 200 is an innovative solid state amplifier head that delivers particularly natural guitar sounds that cannot be distinguished from a tube amp in terms of response, dynamics and harmony thanks to its on board Spirit Bionic Tone Generator The 4-channel head covers the most popular sounds of the past decades, from absolutely transparent clean sound to juicy crunch and overdrive to aggressive high gain metal distortion. A comprehensive effects section is available for sonic diversity, whilst the integrated Dual Breakpoint Noise Gate tames unwanted background noise. With 200W in regular operation, the output stage of the Hughes & Kettner Black Spirit 200 provides sufficient volume reserves for large stages, but thanks to the 2-stage power reduction, the amp can also be used in the home without issue. 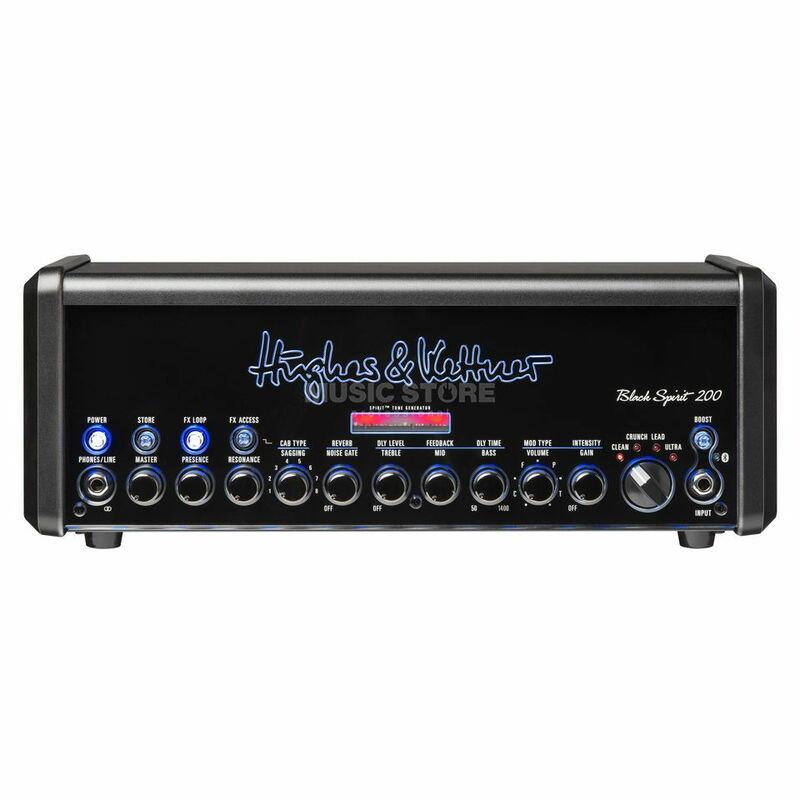 The Hughes & Kettner Black Spirit 200 is fully equipped on the connection side and offers the integrated Redbox AE+ optimal conditions for the direct pickup of the guitar sound, while Effect Path, MIDI, Bluetooth, Aux-In and headphone jack complete the equipment. With its 200W power amplifier, the Hughes & Kettner Black Spirit also offers sufficient volume reserves for use on the big stage. Thanks to the two-stage power reduction, which throttles the power amp to 20 watts or 2 watts, the amplifier can also be used easily on smaller gigs or in the home with a neighbour-friendly volume. Another special feature is the possibility of connecting full-range loudspeakers to the guitar amplifier in addition to guitar speakers, whereby a loudspeaker simulation provides the accustomed playing feeling. The Hughes & Kettner Black Spirit 200 also features the integrated Redbox AE+ with balanced XLR output and the simulations of 8x different loudspeaker types, which guarantee a natural sound with a strong character, for the direct micing of the guitar sound. The guitar amp can also be controlled via MIDI, while the Bluetooth interface allows you to stream backing tracks and control them via the free Hughes & Kettner app. An Aux-In and a headphone jack are available. Hughes & Kettner Black Spirit 200 | All you need to know!